On the bocce court, everyone is on a level. An ancient form of lawn bowling, bocce (from the Italian word for “ball”) requires players to target a small ball (or “pallina”) with larger ones. 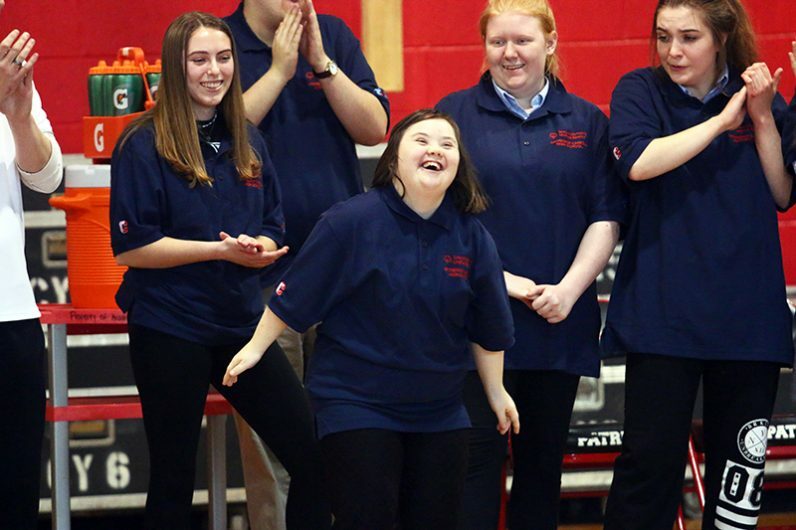 Popular throughout the Roman Empire, European royal courts and the Italian countryside, the game fosters teamwork and conversation – making it the perfect choice for a new partnership between archdiocesan schools and Special Olympics. 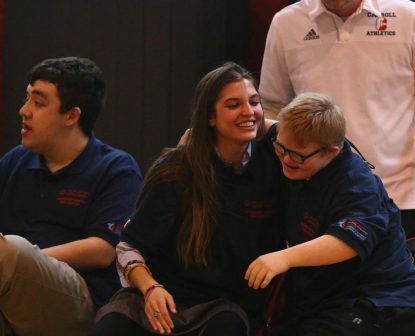 The collaboration has resulted in a Unified Indoor Bocce team, which consists of students from both Archbishop John Carroll High School and St. Katherine Day School (SKDS), one of four archdiocesan schools of special education. Coached by Archbishop Carroll instructor Ed Scanlon, the team is the first Unified Sports Catholic school team in the state. Operated by Special Olympics, Interscholastic Unified Sports (IUS) is a fully inclusive co-ed afterschool athletics program that brings together students with and without intellectual disabilities. Funded by the Pennsylvania Interscholastic Athletic Association (PIAA), the Bureau of Special Education and the Pennsylvania Department of Education, the program promotes acceptance, understanding and respect. On Jan. 23, the Carroll-SKDS students played their first match of the season, hosting Souderton High School. Prior to the game, the crowd sang the national anthem, led by Archbishop Carroll’s mixed select chorus, and enjoyed performances by the school’s cheerleading team. Carroll-St. Katherine lost the best-of-three series two games to none, falling by scores of 4-5 and 3-8. Yet the day added up to a win for the team members, who included Carroll students Madigan Gallagher, Mirabelle Gallagher, Mikayla Kloc, Fatima Brown and Elizabeth Woodland; and SKDS students Rose “Muffy” Tulskie, Matt McKeon and Matthew Rodgers. 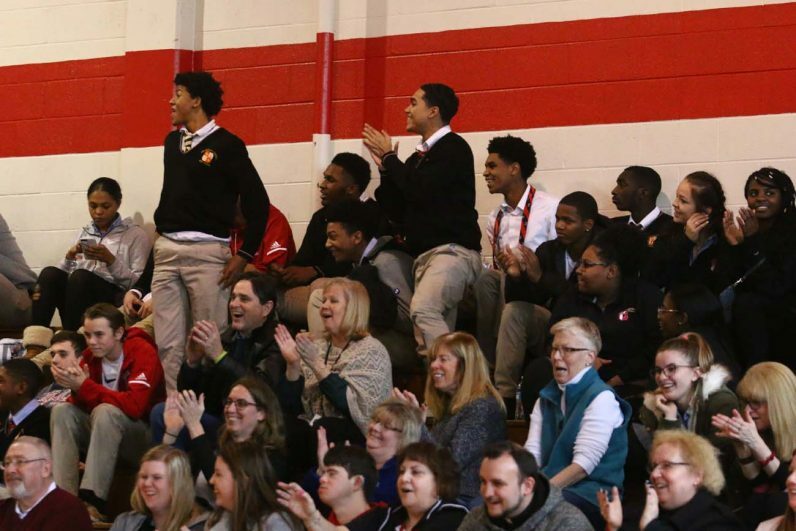 And although the students simply see each other as teammates having fun, the initiative marks “a historic and groundbreaking moment,” said Mike Bovino, senior adviser for Special Olympics of Pennsylvania. With their first competition under their belt, the team will return to its twice-per-week practice schedule to prepare for at least three more matches.